Are you ready for over an hour of on-the-job training on sound system design for small venues with one of the most experienced sound system technicians in the world? Yeah you are! How to measure sound systems in heavy wind. Dealing with highly reverberant spaces. When to subdivide your system. The advantages and disadvantages to coupling your subs. How to setup a basic cardioid subwoofer array. How to aim a pair of L/R mains. The next update to SIM3. Combining speakers and microphones with shape and scale in mind. The best way to potty train your dog. Outdoors you take picture after picture and then lay them over and see where the trends are. You have to throw out certain ones that are not plausible. Nobody goes into acoustics because they think I’m going to get really good at putting fiberglass on the walls to make dead rooms, but in the world of small spaces that are going to do loud music that is exactly what you need. The overflow that you have potentially on a wall is no worse than you have, as a certainty, into the other speaker that’s coming from the other side. The HASS effect or precedence effect (or whatever you want to call it) is vastly over simplified in people’s brains. 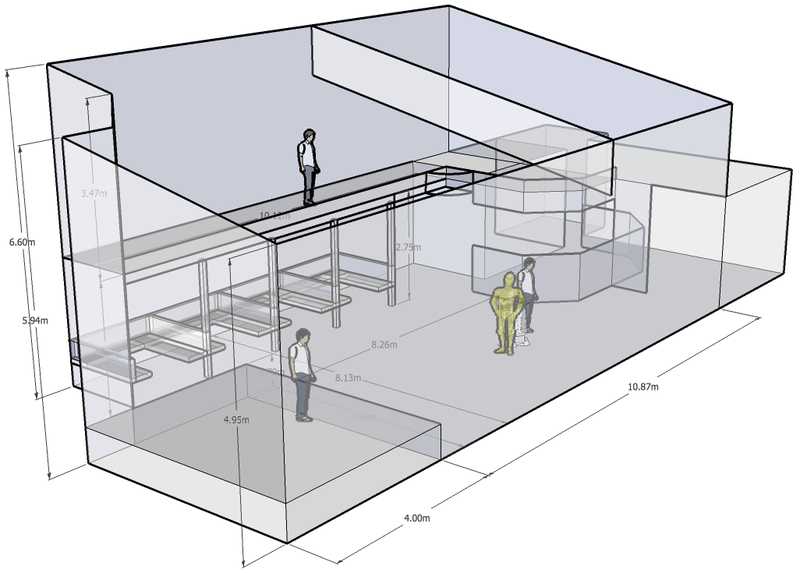 System design for small rooms is much more challenging and difficult than large spaces. Q: What’s the approach in sound design for venues with bad acoustics that are very reverberant? I have mixed in these places and I must say that I’m trying hard to forget the feeling. 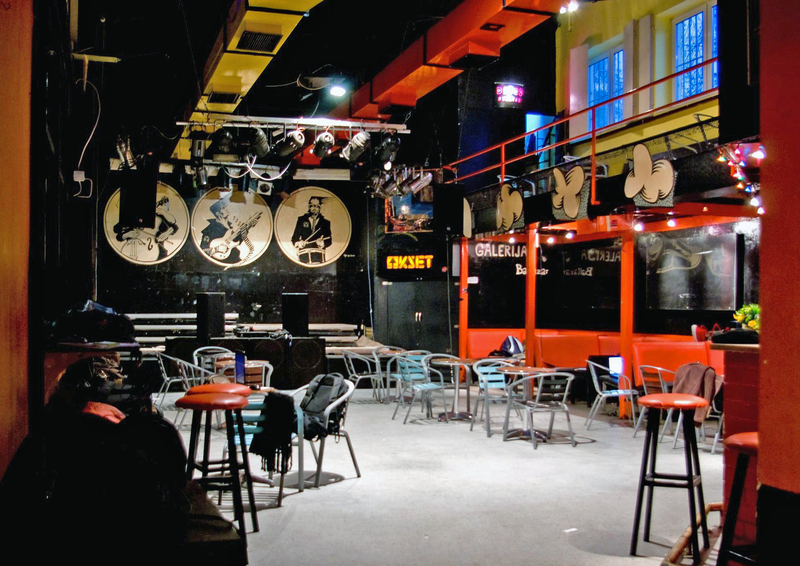 It is very often the case that the owner of the club has spent money buying a decent sound reinforcement system, but then doesn’t care about acoustics. Or, there are cases when a concert is produced in some kind of multipurpose venue (which is normally a warehouse) and you are expected to create great sound. Would it help to try a more “distributive” approach. Q: What about using the Haas (or precedence) effect in sound distribution? Bob says that delaying sound systems further then the first arrival of direct sound will mess with the phase, but what about spatial feeling? Q: I mix a lot of great bands at a student club. Capacity is about 300-400 people. It has a balcony and under-balcony space. It would be great to have Bob’s opinion on how to distribute the speakers because this venue is part of the Faculty of Electrical Engineering and Computing and some students (volunteers) in the club are studying in the Department of Electroacoustocs so they are hungry for knowledge (as I am). Four bass speakers in first raw are just barrier for audience. 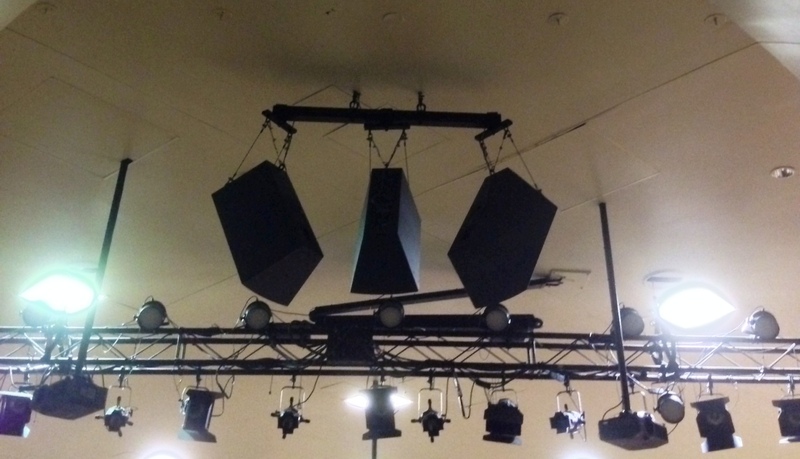 Mid/high boxes (EV XI-1152 – Rotatable 60° x 40°) are 2.4m from floor to bottom of speaker. You’ll see also some JBL speakers behind EV (on middle of stage), but those are not in use. Sound system design for a rock show with six actors on close-mic’d wireless, and a band of piano, bass, drums, violin, and sampler in the stage-right wing. I really wanted to fly speakers over the stage, but in this space it’s not going to happen (no roof infrastructure at all, not even for lighting) so I am resigned to two speakers on tall stands at the sides, angled in and tilted down in an attempt to get an even coverage. Based on the basic rule from Bob (summarized in your earlier article) of “back row on axis at distance 2D, front row at bottom edge of coverage at distance D”, I think it’s close enough. In this case, with 90×60 speakers, it works out to ~9′ up, 15 degrees down, and about 25-30 degrees in to avoid the hard side walls. If all goes well, I will be borrowing a pair of Nexo PS15s (original version – 100ºx55°) and a pair of PS8s (100ºx55°) which will go on the floor in the middle as front-fill. 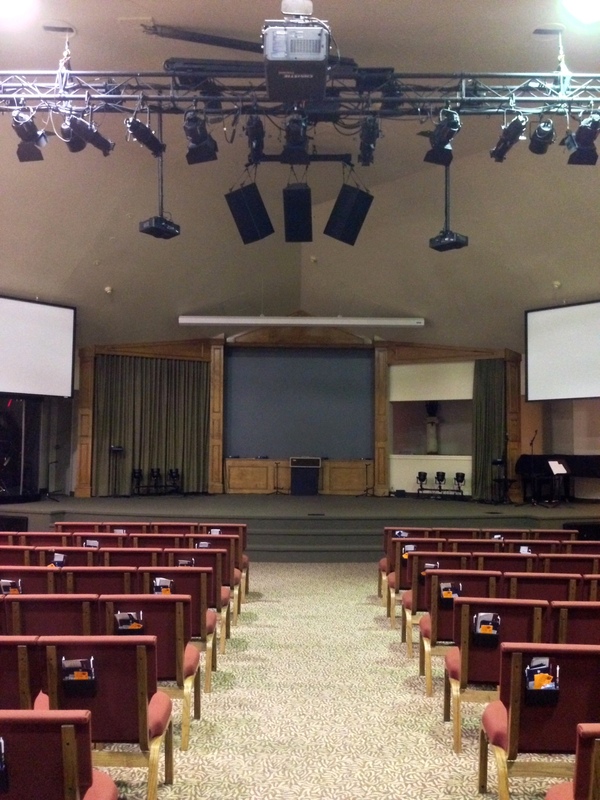 I am in the process of redoing a PA in a 650 seat worship room and have been trying to find the best placement for the subs and mains. The stage is in one corner with mains directly above the steps currently aiming at each aisle. The center speaker has moved slightly off center and the x-over between the mains is in the middle of seats. I have stressed the concern of rearranging the seats so the x-over is in the aisles. I can rehang, reposition, and the speakers can be visible. My thought was to flip the mains over so the horn is at bottom to get past the projectors. EV has seen the room and suggested that, too. Here is the info of our current set up, along with photos and drawings of the room. 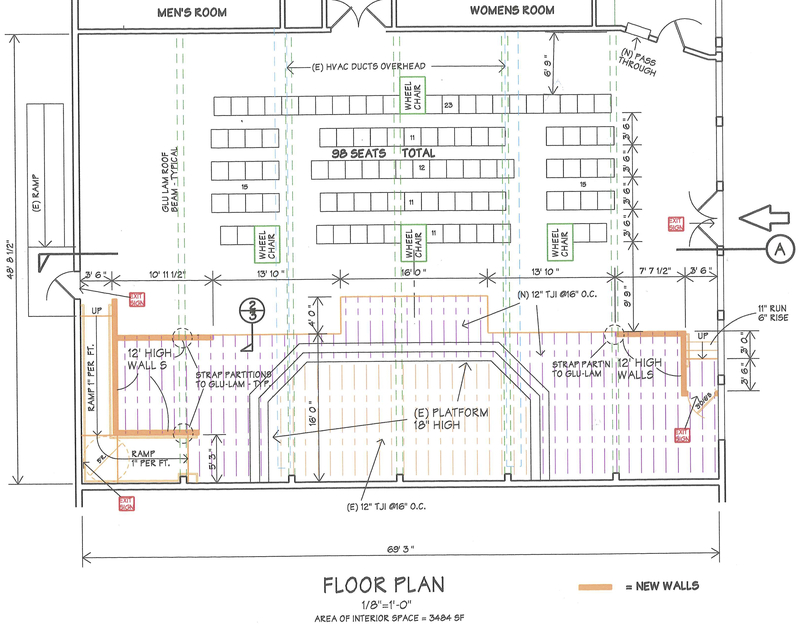 70’x70′ square, ceiling height is 20′ from floor, 18′ from stage. Walls are just drywall, 2 being outside walls with brick veneer on outside. The ceiling is gypsum, suspended. Above it is empty with metal roof. This part of the building is actually shaped like a pyramid so roof peaks near center of audience about 45′. Q: When is the next update to SIM III coming out? It’s been a while. Q: I have a theory that if I use the same model of microphone on every input and the same model of loudspeaker on every output, the sound will be more even and smooth because in the interaction between microphone and speaker there is only one frequency response instead of 12 or more if I use the typical 4-6 types of microphones and speakers. Do you agree? Does this work in the real world? That was the most entertaining education ever. Any chance a recording of the webinar will be available for those who missed it? I’m designing a custom portable PA system for a small church venue (about 80 seats) with adobe walls. The installed system is all wrong and either you can’t hear or there’s feedback. I’m designing and building the electronics and speakers myself, but I left the microphone up to Mr. Peavey (a cardiod). The whole thing has to be light weight enough that the proverbial “little old church lady” can handle the thing. And so simple and straightforward that the only to screw it up is to forget to turn it on. I know that the goal of “can’t screw it up” won’t actually be met, but it has to come close to that because I can’t be there to babysit it. …. Your essay provided some good clues as to things like placement, frequency response, etc. Particularly like the advice that “feedback eliminators ain’t worth a schitt” because I was headed into that swamp and know now to avoid it. Thank you. Here’s my favorite demo. https://www.youtube.com/watch? And here’s my comment from 2 months ago. Scientists measured sound propagation and discovered that kulning traveled farther than other voice sounds https://en.m.wikipedia.org/wiki/Kulning but they didn’t offer an explanation why it works. Here’s the explanation. For you folks everywhere besides the USA, 1 mile is 1.6 km and 1 foot is 30 cm. 33 feet is 10 meters. Key elements in kulning are tones of long duration, with half and quarter note changes in pitch. The researchers determined that this carries farther in the open environment farther than other kinds of singing that are otherwise similar. In general, high pitched sounds are diffused by atmospheric turbulence and multipath with physical obstructions more readily than low pitched sounds having longer wavelengths. In that sense the high pitches work against you, but the voice and the ears work better at the higher pitches and make up for it. Up to a point. But there’s more to it than that. A continuous pitch of long duration has coherence. Atmospheric turbulence does weaken it by diffusion, but it retains nearly its original character. A continuous tone however contains no information other than its presence or absence. To convey any more information than that, either the amplitude or the pitch has to change. Actually, changing the amplitude produces pitch sidebands: this is the physical basis of AM radio communication. It’s also why sinusoidal amplitude modulation and pitch modulation (tremolo etc.) are almost indistinguishable to the human ear. A sudden change in pitch isn’t so sudden after all, it produces sidebands and results in amplitude modulation. The greater the change in pitch of a sudden change, the greater the energy in higher frequency sidebands and therefore the less the coherence. This is why the VLF FSK signals of major navies operating submarines around the world have very small frequency shifts. It’s just an electronic method for calling sea livestock. In kulning, you want a change in pitch to be preserved, by being a small enough change in pitch that as the sound waves from the first tone to the second tone interfere by bouncing around among trees and diffusing over hilltops etc. the waveforms are so similar that coherence is preserved over long distances. To put it another way, a long distance communications channel with multipath propagation chokes on broadband signals, you have to put the energy into narrowband signals and accept the fact that communication rate will be slow. If you can’t receive the signal, it doesn’t matter what you thought the communication rate should be. The cows in the forest over the hill don’t need Shakespeare or the Kalevala. All they need is Kossera kom hem! and in mixed-herd situations they need to know who’s calling them which is a choice of perhaps 3 farms. If there are goats, then everyone needs to know Gjet!Gjet!Gjet! distinguished from Kor/Kossera. So, let’s do a bit of high school physics here. We need 1 bit of information to say the signal is or is not present. We need another to encode cow vs. goat. We need two more to encode which farm is calling. And, let’s suppose that “come home” is not the only possible message, maybe there are a couple more like “hide in the trees, the Russians are coming!” About 6 bits of information. This isn’t going to require a high data rate. The message will probably be repeated at least once or twice just in case nobody was paying attention the first time around. This ain’t happnin’ in Montana, we’re not calling livestock from 5 miles away. It’s Scandinavia. Let’s say max 1 mile. Sound travels that far in 5 seconds. Let’s say the pitch is on the order of 900 Hz. (Just for reality check, soprano C aka high C that most folks have trouble hitting is a babyscream 1046 Hz.) At 900 Hz, wavelength is 1 foot. If multipath creates two paths with equal attenuation which differ in distance by 1 foot, you’re going to get cancellation. But it ain’t quite that terrible, if the distance is 2 feet, you reassemble the previously split waveform. And, even in the 1 foot case, the direction the waves are propagating are not the same and they will diverge and no longer cancel (superposition principle). This is a sound that is propagating in all directions anyhow, there’s no way to aim it in the direction you think the cows are and not have it go everywhere else too. Bottom line: a continuous tone can probably propagate fairly well through the forest, diffuse over hilltops, etc. A lower pitch would propagate even better, but be less compatible with voice production and cow ears. The propagation path is relatively constant, the trees aren’t going anywhere. There is atmospheric turbulence, sometimes not much and other times it’s a deal-breaker, sorry. The cows know where to hunker down in a storm without you having to tell them. The human ear can easily resolve a pitch difference of about 1/4 tone (the standard welltempered musical scale is based on 1/2 tones). The frequency shift of a quarter tone is 3%. That means if you do a quarter tone shift at 900 Hz, the coherence distance is 33 feet. Plowing through a thicket of trees with 1 foot trunks and smaller branches, there is attenuation because the size of the objects is of the same order as that of the wavelength. But, the size of the tree trunks is very small compared to the 33 feet coherence distance. This is a signal that can travel enormous distances through the forest before the two different tones become scrambled with each other and can no longer be distinguished. Then, what is our theoretical limit to data rate? The velocity of sound is 1100 feet per second. In 1 second, we could pack 1100/33 = 33 bits of data, but only an auctioneer can change pitch controllably that fast. And the human ear can hardly resolve pitch changes that happen that fast. Back to reality, we’re talking about pitch changes that have to be slow in order to get them at the correct pitch, and have to be slow so the ear can have time to decide what the pitch is. There’s no rush, if the cows are stampeding they’re not listening anyhow. So, what happens with sudden large changes in pitch? Up close the waveforms are preserved. As the signal propagates through a multipath medium, the signal where the pitch changes and therefore lacks coherence is increasingly attenuated, and what happens at a distance is you get the two pitches in succession with an amplitude dropout between them. The signal is still communicated provided that the individual pitches are maintained long enough to preserve their coherence. So, what do we have in kulning? Calls of typically several seconds with up to about 6 or perhaps a few more pitch changes, maintaining sufficient coherence through a multipath propagation environment to communicate Kossera kom hem! for about a mile. https://www.youtube.com/watch?v=Yy90wZbepiE A swan wants to see and hear more. https://www.youtube.com/watch?v=YsuXuGXgXQw Beautiful and delightful lyrics, has an English translation been published anywhere? https://www.youtube.com/watch?v=8rVFAijnM0E Not great art, just silly fun. https://lifeatmennageriefarm.blogspot.com/2015/12/kulning-why-name-to-sing-with-goats.html Great story by a gal who keeps goats and discovered first they love to be sung to, and then learned about kulning. I don’t know what to say except: BEST. COMMENT. EVER. Good luck with the sound system design. Keep us updated.